Have yourself a premium audio experience at your desk with Logitech MX Sound Premium Wireless Speakers. Listen via Bluetooth or a wired connection and seamlessly switch between them with the Logitech Easy-Switch feature. With 24 Watt Peak(12 Watt RMS) power, high-end drivers and uniquely designed port tubes extending the bass range, these speakers deliver balanced audio that accurately reproduces the sound artists intended. You can adjust the volume and pair Bluetooth devices with a light touch to the motion-activated, back-lit controls on the speaker front. Additionally, these elegantly crafted speakers include silver accent rings, motion-activated back-lit controls, and high-end fabric covers. 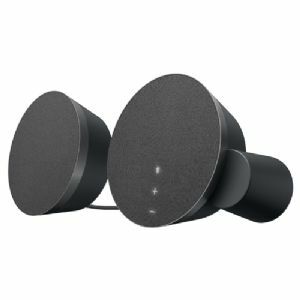 Buy Logitech MX Sound Premium Wireless Speakers now!